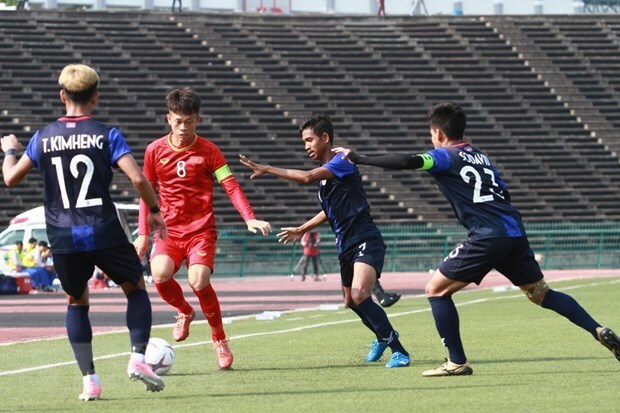 Phnom Penh (VNA) – Vietnam’s U-22 football team ranked third at the ASEAN Football Federation (AFF) U-22 Youth Championship after beating host Cambodia 1-0 on February 26. Vietnam pressed high in the first few minutes as they looked to pin Cambodia in their own half. However, no goal was made in the first half and both sides went into the break level on score. In the second half, much of the game was played in the middle of the park as the two teams tried to assert their dominance over the other. Vietnam then broke the deadlock in the 86th minute when forward Le Xuan Tu ran on to a cross before flicking his header in the far corner.